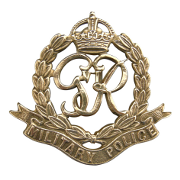 Notes: Royal Sussex Regiment attached CMP. 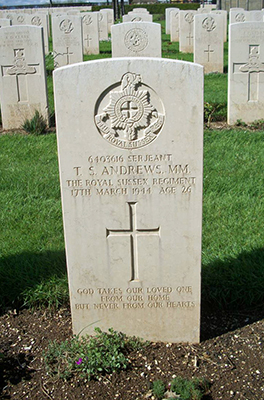 19/4/44 Notification received from 6 New Zealand Field Ambulance that Sgt Andrews died of wounds received on 17/3/44. 4 Indian Div Pro Coy. Unit War Diary WO 169/18788. Inscription on gravestone: God takes our loved one from our home but never from our hearts. Citation: Military Medal Citation. Italy On 28 February 44 Sgt Andrews of the Provost Wireless Traffic Control Section received orders to connect VILLA TP to CAIRO TP by telephone and to lay the wires anywhere. This communication was vital in order to warn vehicles approaching the CAIRO circuit of enemy shelling, and to allow vehicles to proceed safely through the circuit only when shelling had temporarily slackened. The circuit is a vital link for maintenance of forward troops. He commenced work at about 0900 hours and had completed laying the line during the morning, but owing to heavy shelling the line required continuous repairs. For 3 days Sgt Andrews tested and repaired many cuts in the line under constant shellfire. With complete disregard for his personal safety he kept this vital communication in working order. On the 2nd day whilst running a new section of wire from his jeep he was blown up by a mine and though considerably shaken by concussion kept up his patrol of the circuit and repairs to the telephone line that day and insisted on continuing his work next day. He was soon after posted to command 5 Brigade Pro Unit so that, in his own words "I could keep my eye on the CAIRO circuit" and on 17 March he was seriously wounded in the vicinity of VILLA. He was an inspiration to all those who worked under him. Awarded an immediate MM which was recommended by Captain L C Cook OC 4 Indian Div Pro Coy CMP(I). National Archive WO 373/6.